March 4, 2016 October 21, 2017 Laurel L. Russwurm Canada, Proportional Representation, PROPORTIONAL REPRESENTATION for CANADAAuthoritarianism, Autocracy, “First Past The Post”, ballot, Bernard Généreux, British Library, Charlottetown Accord, citizens, civic life, conscription, Craig Scott, decree of the plebs, democracy, Dictatorship, Direct Democracy, elections, electoral reform, Empire, families of electoral systems, Fascism, Greek city states, human beings, human rights, Larry Diamond, majority government, meaningful electoral reform, Medievalart, Monarchy, Montmagny—L'Islet—Kamouraska—Rivière-du-Loup, Oligarchy, openclipart.org, or plebiscite, P3, political systems, Prohibition, Proportional Representation, referendum, representative democracy, rule of law, Sean Graham, single member plurality, Stéphane Dion, totalitarianism, Tumblr, ual Member Mixed Proportional, votes, Wikimedia Commons, Wikipedia, Wilf Day, winner take all. ← What’s So Bad About First Past The Post? Nice work Laurel! I am going to share this with a group we are starting here on Salt Spring Island BC to inform ourselves about voting systems and perhaps start a FVC Chapter. 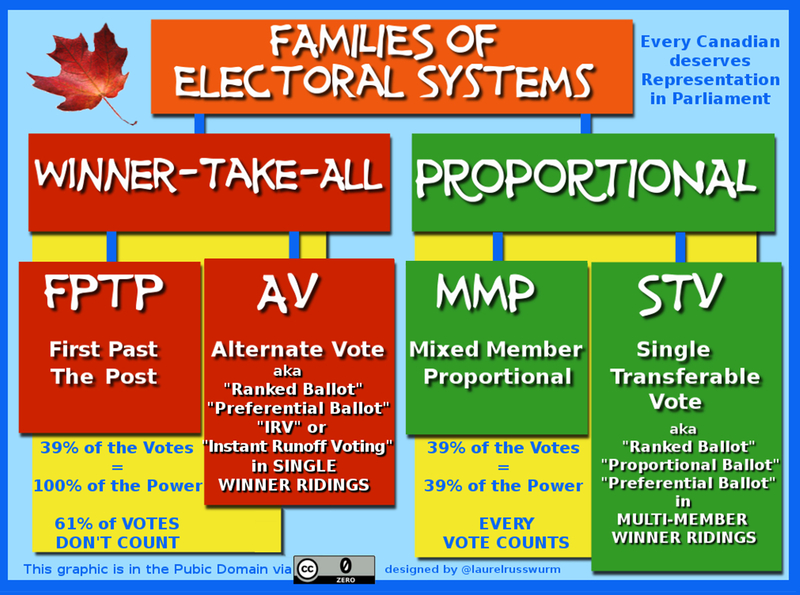 This is a very well put together backgrounder for Voting Systems in Canada.